What is the most optimal way to structure your data organization for maximum impact to your business and your customers? Today’s business world calls for adaptive data teams that can produce results in advance of people asking for them. As a data team we need to be thinking ahead of what requests we’ll get and start preemptively collecting and structuring data for analysis. This way when questions do arise we are well prepared to provide guidance to business decision makers. First and foremost you need executive support. Without this you’ll have little chance of success since the resources and guidance needed are substantial for any business. Let’s take a look at the process for how data is transformed from raw bits into meaningful insights. Data are generated in a few places typically for most organizations. 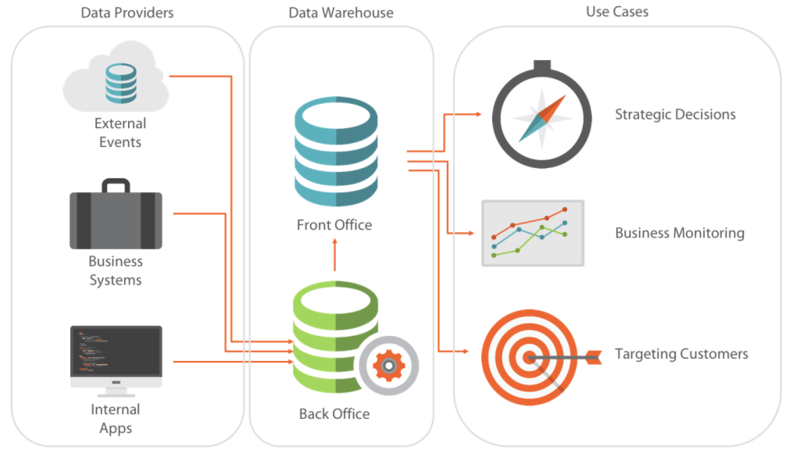 From there, the data is landed into a back office staging environment, typically some form of a database, then is transformed via data modeling techniques, into usable data sets for analysis. After the data is collected, organized, cleansed, and structured in a human friendly format, your analysts and data scientists can start using it to solve business problems. With these three teams all working together you’ll be setup for success. In following posts I plan to dive deeper into what the key ingredients in each one of these areas are so you can understand what it really will take to become a data-driven organiztaion.